Hillcrest, 27 Gainsborough Road, Winthorpe. Refreshments – After a short discussion it was decided to charge 3d for a cup of tea and a sandwich. Sunshine Box – This is still in existence today, nowadays we visit any sick member with a card and a gift card. There is no explanation of how it was used in 1954. 6th Apl The second meeting it was proposed that two members should be asked to attend Denman College and an allowance of £6 would be allocated, the remainder being provided by the chosen members. Also at that meeting an inclusive charge of 1/6d would be made for a visit to East Stoke, this would allow a 5/- tip for the driver. 8th Apl Outings – A decision was made to visit Windermere for a summer outing. 13th May Newark Group – Winthorpe was informed that it was attached to Newark, Coddington, North & South Clifton, Girton and Thorny. 31st May At the third meeting it was noted that the fee for hiring the village hall was raised to 15/-. 1st July Mrs. Mills the rep to the AGM at the Albert Hall, Nottingham gave an account of her visit and the Queen Mother's address and expressed her appreciation at being chosen to attend. Letter received asking for pen friends from America. Mesdames Scott, Couplands and Mills decided to write. 10th Nov Pen friends to send gifts to America. 15th Nov The Sunshine Box was discussed and it was decided to give small gifts to anyone in the village that was ill.
8th Dec Birthday Party – Members were to be asked to pay 1/- each towards the birthday party in February and to have games for entertainment. July The Drama Group must have been formed immediately the WI came into being for on 9th May 1955 we read that the sum of £4-15-9 was made from the recent plays by the Drama Group. Also on the 11th July 1955 it was decided to pay the bill for the electric lights, which were damaged at the hall during the plays. At this time the WI were busy holding parties for anyone over the age of 65. It is also interesting to note that Mrs. Morgan, Mrs. Frew, Mrs. Scott and Mrs. Pack were members at this time. Nov The Sunshine Box was under discussion again when it was agreed that sick people had to be over 15 years of age to receive a visit and a gift. 13th Dec Suggested programme for 1957 was read out with a proviso for alterations due to petrol rationing. 14th Mar The Group meeting is to be in October and the competition is to be a dressed doll 16" high. Apl It was reported that 44 members had paid subscriptions and some were still outstanding. July A children’s party was held in the village hall for tea and then the party adjourned to the cricket field for games etc. 10th Oct Group Meeting – Mrs. Sheldon (President) said the meeting was successful and Winthorpe WI had won the competition for dressed doll and would hold the plaque for one year. 14th Nov Mrs. Sheldon re-elected as President. Sept Mrs. Sheldon, the President purchased a canning machine for £3. This meant that each member would get three free cans. It had been tried out at Mrs. Gent and found to be most satisfactory. 9th Apl Drama – Winthorpe won the silver cup at the Drama Festival. June Cricket Match – Husbands v wives. If wet a whist drive in the Village Hall. Nov The committee requested the secretary to write to the Trustees of the Village Hall to ask for a reduction in the charge of 15/- to bring the WI into line with the charge made to other organisations. Jan Mrs. Gent announced the Notice Board was ordered for The Spinney. Reply to the request for reduction in charge rejected. But the letter from the Trustees suggests that all organisations have a grand prize draw for hall improvements. Feb It was suggested that a piano be bought for the WI and an advertisement to be put into the paper. Mar Mrs. Pulfrey had found a good piano for £15 and it was decided to buy it and Mrs. Pulfrey to arrange to get it tuned. Apl Piano voted very satisfactory. Mrs. Sheldon said cost would be about £3 and Mrs. Walker and Mrs. Thacker had given gifts of money towards the cost and a charge of 5/- would be made for anyone wishing to use it. 14 July Bell – A call to order the bell was given by Mrs. Briggs. 8th Dec Birthday Party – Food – 12 doz rolls, butter, ½ lb cheese, hotel biscuits, cooked ham, cooked tongue, salt, mustard and salad cream. Lettuce, tomatoes, beetroot, eggs, cress etc. Each committee member made a trifle for which she was paid, Birthday cake made, iced by Miss Gerrard. Crockery was hired from Swindlers, North Gate. Medium plates 6 doz. glass dishes for trifle, 6 doz cups and sauces. Admission to party 2/6. Throughout 1960 the question of buying a piano is high on the agenda. Mrs. Suter, Puffey and Frew raised £10-10-0 at a social to pay for the piano. Jan WI Crockery – Samples of cups, sauces and plates showing a WI crest were approved and sent for. Costs being approximately £11 including purchase tax and posting. Nov New committee elected and Mrs. May Newton was elected president. Dec Letter to the Rural District Council and County Council to have the village pond cleaned out to get rid of rats as people was dumping rubbish in it. Piano tuned at a cost 2 Guineas. July Cricket Match – Ladies won by 7 runs. 30lbs of sausage were used and the profit was £1-7-2. Dec Mrs. Morgan presented Mrs. Newton with a box of cigarettes as a token of appreciation for her years work. Mar Birthday Party – Village Hall completely frozen up in February and suggestion made to move it to April next year to avoid bad weather. 13th June Newark WI market stall final details to be opened each Wednesday from 10 to 12 noon. Special labels and wrapping must be used. Oct Main road into the village was cut by the Newark by-pass. Bus service reduced considerably causing hardship. A resolution was proposed by Mrs. Morgan and seconded by Mrs. Briggs to give the village either a bridge or underpass for vehicles to cross the by-pass. Copies were sent to Mansfield NCC and Newark RDC. Dec Gift of cigarettes for Mrs. Newton. Mar Letter from NFWI that each institute is to send an extra 6d to the Federation. It was decided that this should be sent from WI funds and not individual members. Apl A letter was sent to the Director of Education urging the village school to be kept open. Oct A WI choir to be formed and the meeting held on October 14th. The choir hope to give their first performance at the December meeting. 10th Dec Mrs. Bennett elected president. 11th Feb Winthorpe WI invited to send a member to the Royal Garden Party and Mrs. Pulfrey was chosen as a result of a ballot. 8th Apl Mrs. Morgan requested that the Parish Council have a notice board at the Woodlands end of the village. This is proving difficult as it is an expensive item, around £12 and secondly not easy to find a site. May This was the Golden Jubilee Year for the NFWI. Two of our current members are named in the minutes, Mrs. Hopewell and Mrs. Morgan. The latter being named as the elected captain for a forthcoming cricket match. The ladies beat the men and in September a return match was played and once again the ladies were triumphant. The committee was looking into the cost of folding tables for the hall. The local over 60’s and widows were given an outing by the WI and then treated to supper in the Village Hall. Concern was expressed at the low entries for the competitions. A choir was formed at the end of 1964 and was making great headway, in 1955 being asked to perform in local churches and a choir festival at Farndon. In May 1956 they came first in Southwell Music Festival. A campaign to improve the Village Hall was suggested and approved unanimously. A letter was sent to the Parish Council. Some of our members were nominated for the Executive Committee. Another current member was named in 1966, Mrs. Barbara Nelson, when she was congratulated on the birth of her daughter. Funds were raised for the choir and piano. This piano was a gift through the kind office of Mr. Leach and Mrs. Knighton. The annual cricket match was played between husbands and wives. The wives were beaten for the first time in four years. 40 members attended the meeting. The Institute was still collecting for other causes, for example 3d pieces in smartie tubes, a national appeal. For the birthday party everyone paid 9/- and the raffle cost 6d. Outings were discussed because members were putting forward names and not turning up on the day. It was noted that in future anyone who did this must be held responsible for the expenses. In July there was a Grannies evening. Whist drives were a regular feature. Jan Before the committee meeting the President Mrs. Pulfrey read out a letter from the County Chairman with regard to the foot and mouth disease, which stated that we should think seriously of cancelling our meetings in view of the epidemic. However after discussion it was decided that as we are not a truly rural institute there would be no point in cancelling our local meetings. The cost of engraving the cup ‘Choir Festival’ was 9s 6d and this was approved. Mar Outing to Nottingham to see the Black & Minstrel Show. Newark Show Competition – A subcommittee was set up. This included Mrs. Morgan, Mrs. Suter and the Secretary. It was proposed by Mrs. Wetherill that we gave a bursary to Denman College. Apl A bursary is approved, £5 5s. This was as a result of Mrs. Randall attending a Conductor of Choirs course. It was approved by all. The date for the OAP’s outing was fixed for the 27th June. June Monthly Competition – So few people entered the competition that it was wondered if a 1d fine for not entering would be a good idea. July The OAP’s thoroughly enjoyed their trip and the supper that followed. The President reported that the Choir had been successful at the recent music festival in West Bridgford and would be going to Leeds on the 5th November. Sept Everyone enjoyed the Car Rally. Mrs. Randall to check the forthcoming County Choir Service to see if the choir could take part. The President has received details regarding an outing abroad for 1969. The trip to Austria in June 1969 would each cost £30. Oct The Choir hopes to take part in the Choir Concert in Nottingham. Mrs. Morgan-Jones will sing a solo. The Secretary has arranged for an evening meal at The Lord Nelson. The cost will be £1 including wine. Dec Sunshine Box – It was proposed that as funds were very low it should be stopped completely and cut out visiting husbands or the elderly as this was becoming a mammoth task. Mrs. Bennett congratulated Mrs. Randall and the Choir on their wonderful achievement on getting through to the Albert Hall performance of ‘The Brilliant, The Dark’. Mrs. Wetherill proposed that the institute to pay for the transport to London and this was seconded by Mrs. Bennett. Feb The singing of Jerusalem has been dropped and some members had complained. A vote was taken and the ‘for’s’ won and Jerusalem was to be sung at every meeting. Mar It appears that the canning machine had become a liability and Mrs. Morgan was involved in finding a buyer. Dec WI members were asked to help the Parish Council in the compiling of a Village Scrapbook. Also at this meeting Mrs. Morgan felt we should send a resolution to the County Office for the Spring Council Meeting “This WI deplores that as housekeepers of the nation we do not wish to enter Common Market.” The resolution was put to the meeting 12 in favour and 1 abstained. Jan The resolution was unable to be put forward to County because of unforeseen circumstances, but a resolution from Bingham WI practically covered our own resolution, had been put forward and Winthorpe agreed to second it. Another current member Mrs. Bark was to attend Coddington birthday party. Apl Mrs. Morgan spoke on the possibility of preserving the Alms Houses in the centre of the village. It was decided that we as an Institute should try and preserve these cottages. Mrs. Bennett kindly offered to present a cloth for the President’s table that Mrs. Wetherill and Mrs. Randall offered to embroider. The same cloth is still in use today. During I970 the WI was very concerned that the choir should be helped financially, the cost of coaches was quite a worry. Coffee mornings, Tea Parties and Jumble Sales were held to support them in their endeavours. Nov Throughout the 1970’s there were numerous letters passed back and forth to the Village Hall committee. One meeting was cancelled because it was felt that the Village Hall was in great need of decorating and the WI was ashamed to invite a speaker to such a place. A further letter felt there should be more chairs and pointed out that the hall was being ‘hired’ not ‘loaned’ and there should be enough chairs to go round. Mar Decimalisation – Tea 1p (½p for a second cup) Rolls 1p. Scones ½p and Mince Pies 1½p. Two resolutions were sent to County for the Council Meeting. Once again these “went astray” in the post and despite a second letter to County it was doubtful if they could be accepted at this late stage. Mar Mrs. Weatherill was given a vote of thanks for the beautifully embroidered cloth she had worked for the President’s table. The cloth was kindly given by Mrs. Bennett. At this meeting Mrs. Randall proposed that we complain about the use of Winthorpe Park as a name for a building site on Winthorpe Road. A letter was sent off immediately after a unanimous vote. At the AGM, membership stayed around 46 although only an average of 22 attended. Jan The Committee dinner was held at the Lord Nelson and now costs £1.38 per head. Apl Mrs. Morgan and Mrs. Suter organised working parties for the tidy village competition. May Tennis – Mrs. Morgan and Mrs. Kingdom through to the final of the County Tennis tournament. Four members took part in a caravan weekend. Newark Show Competition – Mesdames Large and Hambling were awarded 87 points for their entry. July Cricket Match – WI v Husbands and also that month an OAP’s party. Dec The President reminded members to show their respect for speakers at the monthly meetings and to keep their chatter to a minimum. Jan The Choir was still in operation and would be entering for the Music Festival on March 16th. May Birthday Party – Held in the school hall. Seats too low, sweets not up to standard, coffee too strong, an objection to queuing for food. July Choir Festival – Awarded third place and asked to sing for the Christmas meeting. Sept The Committee discussed whether to continue with the over 60’s parties, it was felt some people found it quite embarrassing. Sept It was agreed to offer the WI stage to the Youth Club so presumably the Drama Group had drawn to a close. A letter was sent to the Sports Secretary submitting an application to join the darts team. The first darts team Mesdames Morgan, Gilbert, Spencer, D. Hallam, P. Hallam, Birchley, Clarke, T. Treherne and Hambling. Sept This saw the start of the Pretty Parcel Competition for Christmas and to be donated to Charity. The Institute had a regular Christmas Fair with various stalls which was held in the school. They were also active in several community projects e.g. quizzes, skittles and cricket matches. A letter was sent to Newark District Council on increases in car parking. A reply said it had been considered but increases were to go ahead. Apl A theatre visit to see Fiddler on the Roof. June The WI provided a Jubilee Tea for the Old Age Pensioners and the Children. Oct Subscriptions to rise to £1.75. Jan Mrs. Clarke presented a Petition regarding the transporting of live animals to the continent which is to be sent to Mr. Ted Bishop, MP for Newark. Apl The 25th Birthday was celebrated at the Lord Nelson. June A Cricket match was held WI v The Cricket Club to raise funds for two seats in memory of two former members. Jan Mrs. Francis Kelly won through to the finals of the Public Speaking competition. June The start of Focal Point – Mrs. Shapley gave a report as to the layout etc. Mar The Choir seems to have ceased performing when Mrs. Randall became ill. A donation was given to Focal Point. Five charities were recipients of donations from the Institute. A protest letter was sent to a Mr. Tuckman with regards to the stoppage of the ‘daily doorstep pinta.’ An acknowledgement was sent by his secretary but no decision was noted. The following month it had been recorded that there had been replies from Mr. Tuckman and also Mr. Peter Walker the Minister of Agriculture, but it gave no clue as to the result. Jan Beautiful Britain Competition – The telephone kiosk was chosen and Mrs. Shapley offered to undertake the task of looking after it. May Mrs. Morgan proudly displayed the plaque she had received for supervising the WI market stall for 20 years. May At the Group Meeting held at the Youth Club it was pointed out at the Committee Meeting that we would have insufficient chairs to seat all of the guests from other institutes. Mrs. Cynthia Morgan kindly offered the loan of the Village Hall chairs at 5p per chair, Mrs. Leach said she would ask her husband if he would be good enough to transport them from the Village Hall to the Youth Club. Mar Blankets were made for Ethiopia by the WI. May Money was donated to the Maldives fund and they collected labels for training Guide Dogs. July A visit was made to Newark Parish Church, the Church Treasury and also the Town Hall. Mar Tidy Village – Mrs. Kelly attended a very poorly attended meeting in the village. Members were asked to keep the fronts and gardens of their own properties tidy and the village in general. Mrs. Finn kindly offered to maintain the telephone box. Apl Mrs. Kelly kindly offered the use of her garden barn for a summer BBQ, proceeds to go towards the Denman College repairs. July A visit to the Newark Parish Church and the Church Treasury. Sept Mrs. Gold and Hambling will form a small committee to organise a Christmas Pantomime. The WI embroidered a panel for a wall hanging. July The WI helped to raise money for the Church roof and they also knitted squares for blankets for the ACWW. Sept The WI visited the Museum of Lincolnshire Life. Dec The Pantomime Cinderella was produced. Mar A donation was made to the Village Hall. Mrs. Francis Kelly resigned as President and thanked the Committee for all their help. Apl Mrs. Isobel Chipperfield, our newly elected President, welcomed members to her first meeting. May Members were told about the speculation of the closure of the Newark Hospital Maternity Wing. It was agreed as an institute to sign a petition. Members were also urged to do so personally. June Forms were now available for the completion of signatures regarding the Newark Hospital Maternity Wing. July Members visited the garden of Mrs. Dolenz. We had a White Elephant Stall at the Church Centenary There was a petition passed around about the closure of the Newark Hospital Maternity Wing. Sept Mrs. Chipperfield read a letter sent by Jackie Topliss to Dr. Gillian Todd regarding the Newark Hospital Maternity Wing, raising objections from Nottinghamshire WI, nevertheless, to no avail. Oct Members were informed that Mrs. Peggy Hambling had died. Peggy was a dearly respected member, committee member and past President Two minutes silence followed by the singing of Jerusalem played on Peggy’s piano by Mrs. Sylvia Lloyd. July There was an outing to Doddington Hall. Also in July the Darts Trophy was won by Winthorpe. Oct Presidents were called together regarding a proposed resolution for the next AGM to make the WI a limited company. Literature regarding this was obtained from County House. Mrs. Frances Kelly agreed to peruse this and report to us. Mrs. Kelly pointed out that this would have certain benefits and was basically a sensible idea since, at present, any committee or trustee could be held personality liable if the charity went bust. July A Leukaemia Research Box in memory of Claire Milroy was placed on the table so that members could contribute. Dec Mrs. Cynthia Morgan mentioned that our picture required cleaning and that the frame was in need of repair. It was agreed that it must be restore and also the curtains were deemed to be beyond repair and should be discarded. Apl Mrs. Ann Page is to look into the possibility of evening rambles. May The first evening walk arranged by Mrs. Ann Page. June Visit to Museum – 16 members of 5 husbands. Miss J. Cassidy proved to be a mind of information in the agricultural section, identifying the various gadgets and machinery. Members born in Newark recalled how it used to be swimming in the Trent and the buildings firms used to occupy. Sept Mrs. Cynthia Morgan asked where the new hospital was to be sited. A lively discussion followed. Members were asked to knit ‘jhuggies’ for babies in India. 40 garments were knitted. Oct The Village Hall Committee has decided that the Village Hall is now not suitable for Jumble Sales. Nov A sponsored ‘Knit In’ was held at the home of Mrs. Sylvia Lloyd for the NSPCC. £80 was raised. It was suggested at the committee meeting that a letter be forwarded to the Village Hall committee to request a WI key for the Village Hall. Jan A minute’s silence was observed for Mrs. Gwen Rawlinson, one of our members. Mar Mrs. Daphne Marshall agreed to be our President. Jan A special resolution for WI’s to retain 50% of the subscription paid was voted against. Oct Members were advised that the purchase of new cups and saucers was underway. Apl 40th Anniversary of Winthorpe WI, a happy occasion, photographs were taken. June Cups and saucers have now been purchased. 5 dozen for £193. July It was agreed that the piano could be repaired. Feb Members were asked to knit ‘jhuggies’ for Nottingham Police to take them to Bosnia on the 31st March. Apl A VE Party was our birthday then to mark 50 years after WW11. July Church Garden Party – Red White & Blue theme to mark this special year. Sept Members were asked to fill shoeboxes with toiletries and packed food for the police to take to Bosnia. Apl Members had a ‘Royal Party’ to celebrate the Queen’s birthday. Crowns, jewels and jewellery were on display. The hall was decorated in red, white and blue. Members and guests thoroughly enjoyed this. June Bell Ringing – Mr. Geoff Wells conducted a tour of All Saints' Church Bells for the fit and able. July Mrs. Jo Crutchley organised a promotional fortnight to promote new members for the Winthorpe WI. Members were also asked if they would like to purchase a share in the 50/50 club for £10. The majority welcomed this. A Treasure Hunt through Newark was organised by Mrs. Barbara Nelson. A most enjoyable evening was spent with members dashing up and down Newark Town Centre with sets of clues (one member was found in a fish and chip shop - we think she had a different set of clues to the rest of us!). Nov The problem of obtaining a key for the hall was discussed. Dec Members were entertained by the Committee and five co-opted members to perform the 12 Days of Christmas. May A letter was sent to Mr. Morgan suggesting that the President holds a key for the Village Hall. June Mr. Morgan replied that it was not necessary for the WI to hold a key. 21st – Launch of the Millennium Fund with the WI running the raffle and the teas. £127 was raised. Oct A Jumble Sale raised £75 for the Millennium Fund. Nov Donations were collected in envelopes for the Diana Princess of Wales fund. Jan It is hoped that the WI will at last be allowed to hold a key for the Village Hall in their 44th year. Mrs. Margaret Hewitt kindly agreed to write the monthly reports for the Focal Point and the Newark Advertiser. Feb It was suggested a box be prepared for the Millennium and fitted with photographs, Focal Point, WI cup and saucer etc to be put away and saved. Also a tablecloth is to be made for this occasion. June An inventory of the WI pottery by Mesdames Chipperfield and Crutchley that hardly any of the original cups remained. Nov First 'Banner Meeting' – the banner will depict the Fleet Group each WI designing and embroidering for their own village. Mesdames Chipperfield and Lloyd attended. Members approved of the clock purchased for the Community Centre by the WI. Jan A social evening was held for the event. Candle of friendship was lit and Mrs. Dys Gold delivered some well chosen words on friendship. Mrs. Isobel Chipperfield baked the millennium cake ably decorated by Mrs. Jo Crutchley. Feb Mrs. Karen Marsh VCO attended the meeting because we felt we were in danger of closing due to the lack of interest in forming a committee. Apl Items were sent to Kosova. A by-law suggesting Officers serve no longer than three years was drawn up. May The WI has been asked to man the raffle stall, a cake stall and help with the teas for the opening of the Community Centre. It was agreed at this meeting that ALL record books will be kept by the Secretary. Also at this meeting stewards were provided for the Newark Show. £25 was sent to Mrs. Mary Bullimore for the Bernardo’s Children sent to Australia. July It was agreed that free copies of the Hornblower and members who really wanted the would pay for them. Mrs. Chipperfield suggested we save our coppers for charity and this was agreed. Oct A Harvest Supper followed by an Auction raised £86 for the Air Ambulance. Apl Cancellation of Newark Show due to foot and mouth disease. The WI transferred to Newark Town Hall for these dates. Feb Mrs. Page and Hopewell to resume the WI walks. Apl Theatre visit to see Half a Sixpence. June Members helped at the Jubilee Party held at The Grove. July WI catered for 50 suppers for the Executive Road Show. Dec Trip to Chatsworth organised by Mrs. Barbara Finn. Apl Theatre visit to see My Fair Lady. A coffee morning in aid of the Church Bell Fund. £ 200 was raised. June Sylvia Lloyd proposed we buy a piano together with the Choir to replace the old one. July It was agreed that the WI pay Mr. Brumpton £30 towards the purchase of a piano. Sept The old piano is to reside in the Lord Nelson for sing-a-longs. Past members will be invited to the 50th birthday party to be held in the Community Centre. Oct There were two letters of resignation, one from Mrs. Jo Crutchley who still wished to help in any way she could and then Mrs. Marvin read her own letter of resignation from the Presidency. Mrs. Sylvia Lloyd is willing to act as President until the elections in March. Nov Visit to Calendar Girls greatly enjoyed by everyone. Dec Christmas Party – Entertainment was by Sylvia Lloyd and friends. Christmas music and readings were from members. Mr. Peter Milroy is to be asked to take a professional photograph of the WI for the 50th party in April. Jan Mrs. Jo Crutchley has offered to cater for the 50th party at £3 per head. The committee will provide the puddings. Mr. Milroy has agreed to take photographs and will invite the Newark Advertiser to visit. Also the speaker will be Mrs. Jennie Storr. May The party was judged to have been a happy and enjoyable occasion. Mrs. Margaret Wiseman invited members to her garden for the July meeting. June A very enjoyable and interesting visit was made to the museum of Mr. Steve Jackson. Mrs. Nan Jackson kindly provided refreshments. Sept Mrs. Barbara Finn to organise a trip to Chatsworth in November. Nov Bell Ringers Convention tea organised by WI members. Feb A Songs of Praise is to complete our 50th year with favourite hymns chosen by members. The service will be taken by the Reverend Sylvia Stevens, a Coddington WI member. The WI will hold a coffee morning to help with the renovation of the piano given to the Church by Mr. David Lloyd. The hymn Jerusalem is sung at the opening of all The National Federation of the Women’s Institute Annual General Meetings and also at many local meetings, including Winthorpe. Although it has never been adopted as the WI’s official anthem, in practice it holds that position. The hymn was originally written as a poem by William Blake in 1804, the lyrics were added to music written by Sir Hubert Parry, the well known composer of church music, in 1916. Sir Hubert Parry is the half brother of Sidney Gambier-Parry, architect of All Saints’ Church, Winthorpe. In Englands green and pleasant land. The cast of Winthorpe WI's Christmas Nursery Pantomime held in the Village Hall - December 1982. The cast of Winthorpe WI's Christmas Old Time Music Hall Concert held in the Village Hall - December 1983. Back - Mrs. Tina Bryan. Mrs. Eve Murray. Mis Nancy Harley. Mr. Dennis Bowler. Mrs. Lily Longmate. Mrs. June Taylor. Mrs. Joyce Clarke. Front - Mrs. Isobel Chipperfield. Mrs. Carol Mabbott. The cast of Winthorpe WI's Roaring Twenties Concert held in the Village Hall - December 1984. Mrs. Isobel Chipperfield. Mr. Harold Mabbott. Mrs. Joyce Clarke. Mrs. Lily Longmate. Mr. Dennis Bowler. Mrs. Carol Mabbott. Mrs. June Taylor. The revue was written and produced by Mrs. Dys Gold. The pianist was Mrs. Peggy Hambling. 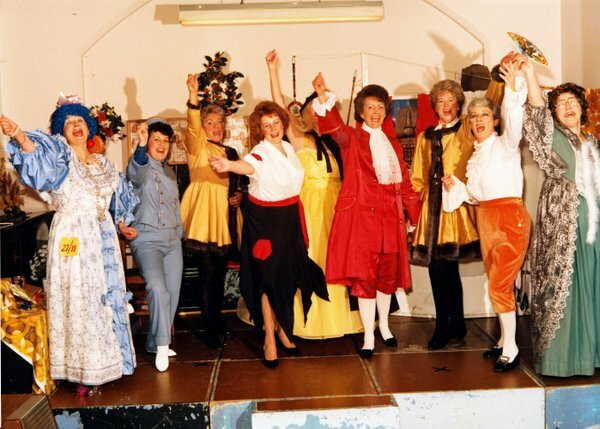 The cast of Winthorpe WI's Christmas Cinderella Pantomime held in the Village Hall - December 1987. Back - Mrs. Joyce Clarke. Mrs. Betty Smith. Mrs. Glenys Breedon. Mrs. Jean Everson. Mrs. Isobel Chipperfield. Centre - Mrs. Daphne Marshall. Mrs. Barbara Finn. Front - Mrs. Carol Mabbott. Mrs. June Taylor. L to R - Mrs. Joyce Clarke. Mrs. Carol Mabbott. Mrs. Daphne Marshall. Mrs. Betty Smith. Mrs. June Taylor. Mrs. Glenys Breedon. Mrs. Barbara Finn. Mrs. Jean Everson. Mrs. Isobel Chipperfield. The planting of a Copper Beech Tree (Facus sylvatica atropunicea) in memory of Mrs. Peggy Hambling. This is at the entrance to the village on Gainsborough Road, Winthorpe - July 1989. Back - Mrs. Doreen Halam. Mrs. Judith Halam. Mrs. Cynthia Morgan. Mrs. Carol Mabbott. Mrs. June Taylor. Mrs. Margaret Bark. Mrs. Barbara Finn. Mrs. Joyce Clarke. Mrs. Ann Page. Mrs. Rose Dickinson. Mrs. Jean Everson. Planting - Mrs. Isobel Chipperfield. Mrs. Mary Shackelton. Besthorpe. Coddington. Collingham. North & South Clifton and Winthorpe. Mrs. Glenys Breedon. Mrs. Isobel Chipperfield. Mrs. Rose Dickinson. Mrs. Sylvia Lloyd. Winthorpe WI 50th Birthday - 15th April 2000. Winthorpe WI President Mrs. Sylvia Lloyd at the Community Centre with the WI Fleet Group Banner.